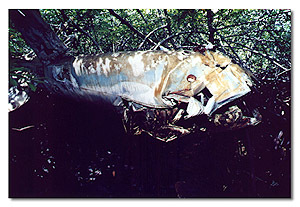 In 1994, my Palauan guide, Xavier, mentioned that he knew a fellow who, while hunting crabs near Koror, had found an airplane wreck in some mangrove swamps. After some effort, I convinced my guide's friend to take us to the wreck (many Palauans believe these sites have ghosts attached and do not like to get near them). It took two attempts after wading chest high in mangrove mud and a detour around an honest-to-God, forgotten-but-still-live sea mine, but we found a Corsair with the cockpit and nose missing. A large debris field, including the wings, stretched for 30 yards to the front and sides around the fuselage. It was clear that the fuselage had been on fire when it crashed. Multiple attempts to find identification plates were unsuccessful until I read an Ocala newspaper article in a Peleliu museum, which told of a Marine Corsair aviator, Lt.Walter Brown from VMF-121, who had been shot down over Koror. The following photos show Walter Brown, ca. 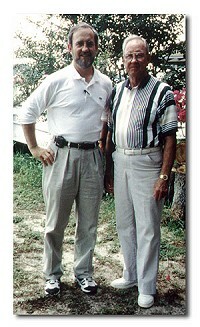 1944-5, and Pat Scannon with Walter at Walter's home in 1998. 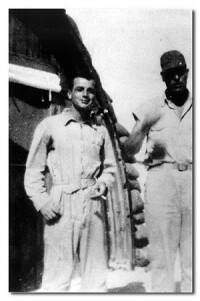 After contacting him, he, in turn, led me to Bill Cantrell, a former Corsair pilot from VMF-114. Between the two of them a story emerged, which resulted in the identification of this Corsair. Two Marine Corsairs, flown by Maj. Stout and Lt. Brown, went down to Japanese antiaircraft fire in this immediate area on 4 March 1945; they had been part of a massive raid on Battery Hill in Koror to knock out those guns. 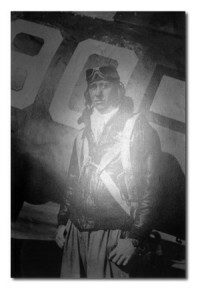 The lack of identifiable Bureau numbers had made it difficult to distinguish which aviator had flown this plane. But after reviewing a number of different reports and photos and interviewing a number of surviving Marine aviators, including a never-to-be-forgotten one with Walter Brown, it is clear that this plane belonged to VMF-121 and, hence, the wreck is what's left of Lt. Brown's Corsair. 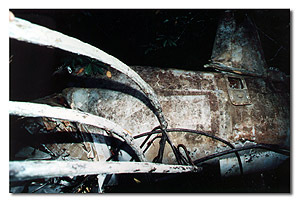 Evidence for this includes 1) the presence of a white band just forward of the empennage and aft of the star and bar, which identifies the plane as belonging to VMF-121, 2) the burn pattern on the fuselage, which is consistent with a hit to the underside of the cockpit with flames moving rearward, igniting the starboard side of the vertical stabilizer, and 3) the absence of certain markings known to be on Cowboy Stout's plane (i.e., a cowgirl emblem on the fuselage star). On that day, Lt. Brown was hit under his cockpit with white phosphorus by AA fire from Battery Hill while starting a bomb run on Battery Hill. With the cockpit on fire (made worse when he ejected the canopy), he miraculously escaped after first freeing himself, badly wounded, burned and with a broken leg, from the rapidly descending plane. He opened his parachute at almost 400 knots (something parachutes and humans are not supposed to survive) and, with less than 2000 feet of altitude, he managed to side-slip his parachute away from the enemy fire continuing from Battery Hill. Under the direction of Major Walter Meyer, his squadron members formed a Lufberry circle around him to strafe enemy positions allowing him to land in open water. [The photos above show Majors Walter Meyer and Claude Welch, ca. 1944-5, and Walter and fans in 1999 (L-R: Chip Lambert, Pat Scannon, Walter Meyer, and B. Brown).] This was immediately followed by a very courageous U. S. Naval aviator, Lt. Comdr. Fred Mamer landing his amphibian PBY nearby, again under heavy gunfire. After three passes, the plane crew finally dragged the waterlogged and injured aviator on board and flew away to safety. Amazing.